The very stylish 1927 through 1936 Auburn models including the famous Auburn boat-tailed Speedster, which was first introduced in 1928, were favorites back in their time and still are today amongst collectors. The subject of this post is the earlier 1928 through 1930 versions, of which we are treated to a photo of a Phaeton Sedan (above) adorned with three beauty contestants, courtesy of Mac’s Motor City Garage. The Central Manufacturing Co. of Connersville, Indiana built the coachwork for the majority of the closed body styles for the Auburn. They became Errett Lobban Cord’s in-house coachbuilders after he acquired a controlling interest in the firm in 1928. 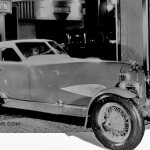 The company also created closed bodies for some Cord and Duesenberg models, but we are not certain who built the open car bodywork for the Auburn after the takeover of Central. The Limousine Body Company of Kalamazoo, Michigan and the Union City Body Co. of Union City, Indiana had built the earlier open bodies and may have continued on with the 1928 and later cars. 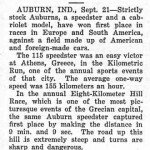 L to R: Motor Age details on the 1928 Models – The 1929 Cabin Speedster – Motor Age coverage in 1928 of Auburn racing wins. Perhaps the most interesting of all was the streamlined Auburn Cabin Speedster (above center) that wore an aluminum body and was propelled by a 120 horsepower, Lycoming straight eight-cylinder engine. The two passenger cockpit featured aircraft-type wicker seats, and it was advertised that the car could reach 100 miles per hour. 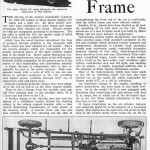 Sadly this it was lost on March 5, 1929 at the Los Angeles Auto Show, which is an interesting story in itself. 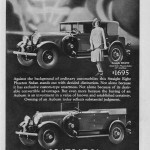 L to R: 1929, 1930 and 1931 ads via Old Car Advertizements. 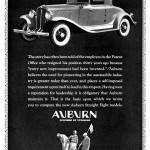 Just below is a circa 1927 Auburn film that starts out by showing the company’s history as a wagon maker and then moves on to an early model of the car. The film then proceeds onto what appears to be the year of 1927 and shows the factory and the production process, both at Auburn and the Lycoming Engine Co. The 33 minute film is damaged and dark in places, but is well worth watching to see some of the rare and interesting footage. 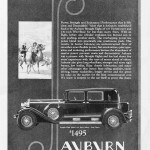 This entry was posted in Auto photos 1921 - 1942, video and tagged 1927 Auburn, 1928 Auburn, 1929 Auburn, Alan Leamy, Auburn Cabin Speedster, Central Manufacturing Co. of Connersville Indiana, Errett Lobban Cord, Lycoming Engine Co. history, The Limousine Body Company of Kalamazoo Michigan, Union City Body Co. of Union City Indiana. This is a very nice and at the same time revealing movie. The early Auburn we see is a 1905 model B with a 2 cylinder engine. The hood suggests a frontal engine, but for me it is a revelation to see that looking at the cranking driver, the engine must still be in its classical place for early American cars: under the seats! It is quite interesting to see the scenes of the bodies being built and the workers power sanding the leaded seams on the body w/no safety gear and the painters wearing just a simple filter. The work at the Lycoming Engine Co. is also intriguing. The Auburn Model B Uses a Large 2 cylinder mounted under the body. Fuel and Water tanks are located under the “hood”. It is very similar to a Model F Buick. Good information. I wish for personal reasons that more could be found on the Auburn ties to the Union City Body Co. My late uncle, Harold Pickett, had worked with Auburn in those days, and was later UCBC plant manager during World War II. His passing at the age of 96 1/2 in 2009 has closed that avenue of information. Hello! I worked for a gentleman,I think with that name. He ran a nursery in Winchester,In. There is a website you might be interested in, unioncitylagrande.